Colonnade between 55 feet do., 25 feet do. Portico--North End 55 feet do., 25 feet do. Principal Story 21 feet do. do. Upper Story to eaves and cove of roof, 18 to 20 feet high. Dig out the whole area, designated on the drawing to the depth, level with the surface of the ground at the north end of the building, or beginning at 150 north of the present Rotunda building, and of a width between the terraces, equal to 185 feet, using the earth so excavated in raising and forming the terraces designated on the drawing. 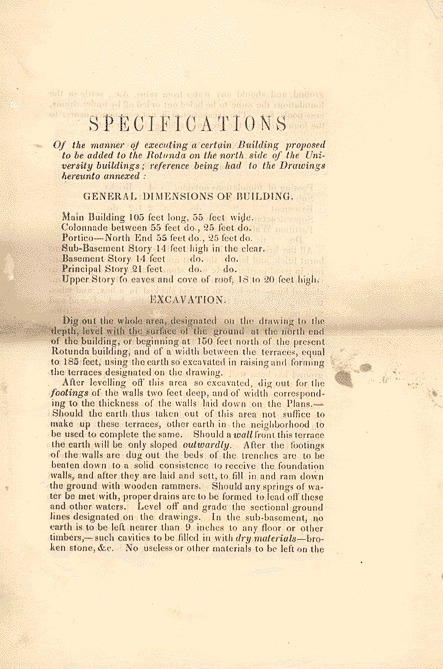 ground, and should any water from rains, &c., settle in the foundations the same to be baled out or led off by under-drains, cess-pools, &c. The excavation will not commence nearer to the foundations of the present building than 20 feet. Sub-basement Walls do. 3 1-2 do. Basement do. 2 1-2 do. Superstructure do. to eaves, 2 do. Partition Walls footing, 2 1-2 do. Do. do. 1 1-2 do. draulic mortar well pargetted, and where other walls are exposed to the weather, the same precaution is to be used. To form the terraces or floors of the portico and colonnade, groin arches are to be turned, laid in hydraulic mortar, spandrils filled up with brick, flush and level, ready for paving with tile or brick. Where fire places are introduced 4 inch Trimmer arches are to be turned for the hearths; care must be taken that no timbers be allowed to touch the smoke flues or fire places. Bed, in mortar, all bond timber, wall, or other plates, lintels, wooden bricks, tamplates, stone or other work connected with the brick work; all the door and window frames to be bedded in and pointed round with lime and hair mortar. Back up whatever of cut stone is laid in the walls. Portico and Colonnade.--Provide and execute walls for piers and arches for carrying the columns, as shown on the drawing. Carry up the columns of the same dimensions of those of the present Portico, the bricks solidly laid in hydraulic mortar, the facing prepared for stucco work, the bases and caps of these column (to be formed of cast iron) to be built in with the brick work. Dead arches to be thrown above the architrave level of Portico to sustain the wall of the tympanum of pediment, which is to be faced in the same manner with the external walls described. Form arch-way and terrace of entrance to the north, through and under terrace on this side, with wing walls outside to sustain the sloping bank; grade and pave the court all round the building, forming the necessary gutters and drains; the bricks to be laid in clean sand, not less than 6 inches thick. Lay whatever hearths are required in the building. Do whatever other brick work is required about the building, whether of walls or paving. All the above work to be done in the most substantial and workmanlike manner, with the best material, the contractor to secure the stability of his work from all settlement or other damage during the time of building, and to make good the same as the architect shall direct. Provide good and sufficient scaffolding, which is to remain for the use of the other mechanics or artificers that may have occasion for the use of the same. space below the top of the joists, the joists to have the usual camber (say 1-2 inch,) and to be not more than 12 inches apart from each other; the floors to be laid with 1 1-4 inch narrow heart boards, secret nailed, cross-jointed, the ends tongued into each other, and the whole dressed off in the best manner. The girders to be bridged and well dress, the ends secured firmly in the walls. For the ground floor, dwarf walls will be built to receive the ends of the joists, which will be well bridged and counter-ceiled before the floor is laid. The rafter stuff of this roof to be laid as purlieus on the rafters, so as to allow the boarding for the covering of the roof to range up and down, instead of cross-wise. Form the necessary gutter-ways on the roof. Rib the cove ceiling, formed of inch boards, doubled and cross-jointed, throughout the whole length of the building, including the Portico and Colonnade, the distance of the ribs not to exceed 16 inches from centre to centre and properly braced or bridged. Frame the ceiling of portico and Colonnade in a substantial manner to form a floor for that part of the upper story extending under the roof here, and lay a floor over the same equal to those before described. Frame and set the galleries on the principal floor agreeably to drawing, all round the room, supported by the cast iron columns before described--floor the same, and enclose it with a light cast iron balustrade. For particulars refer to plans to be furnished by the Architect. Provide suitable benches to all the Lecture rooms, exhibition rooms and galleries, according to Plans. Provide rostrums to each of these rooms agreeably to drawings to be furnished; wide moulded skirtings to be carried round all the rooms. The finish of the windows and doors to correspond with those in the present building. The dimensions of the basement windows to be increased in height as per drawing, more than those in this story of the present building. In the upper or museum story, alcoves are to be formed and shelved for mineral subjects, &c.; the divisions to be made according to plan, with a window in each. Should additional space be required, the upper story or roof floor is to be fitted up by galleries, and alcoves or recesses extending over the ceilings of portico and colonnade, communicating with by the stair cases in the angles, and from the galleries of the Rotunda, lighted from above. Reference to the drawings will explain the whole arrangement. Form a trap door over one of the stair-ways with steps of communication with roof. Construct an open newel winding stair-way, triangular well-hole, mitred nosings and risers, plain brackets, continued cylinder hand-rails of mahogany, square balusters, dovetailed into steps with occasional iron balusters, double turned newels of large diameter, with a turned cap to suit the hand-rail, to mitre to; a little dress or declination to be given to each step, the rise not to exceed 7 1-2 inches. The stairs are to start from the sub-basement floor, and to continue to the upper or eave floor or roof; the height of the hand-rail to be not less than three feet to 39 inches above the steps. Provide, set, and remove all the centres of the arches under the porticos and terraces--lintels to all the windows and doors --wood-bricks, &c., for the bricklayer to wall in for securing the wood work inside. Provide and set the entablature, soffets, and architrave inside of the columns of the portico--all round the building, with the raking cornice of the portico, pediment corresponding with that in the present building, except it should be deemed best to substitute stucco or mastic work in place of wood work in parts of the same, of which due notice will be given by the architect. All of the above work to be done in the best and most workmanlike manner, with the best quality heart or white pine. The ironmongery, used to be of the best finish and quality. Prepare and assist the bricklayer to set all the window and door sills of cut stone, required about the building; the stone to be laid in the direction of its natural bed in the quarry.-- Run a stone belting course, with a proper wash around the building of the height of the portico floor, 7 inches high, and in length not less than 4 feet, the vertical joints to be cramped with iron not less than 12 inches long. The curb-stone round the portico and colonnade to be brought to a width not less than 12 inches bed. Provide and set in their places No. 14 stone plinths for columns and 6 for pilastres, of the dimensions of those in the Rotunda building, Portico, &c.
Prepare and set all such other cut stone work as may be ordered by the architect for other parts of the building. Plaster all the interior walls and ceilings throughout the building, with three-coat-work floated to a straight and smooth surface, with the best quality lime, sand, and hair. Run a stucco moulded cornice around the ceiling of the exhibition room, and in such other rooms as may be directed by the architect. Form in stucco three centre pieces in the ceiling of the exhibition room, according to drawing to be furnished by the architect. Run projecting beads on all the outer angles. Run such mouldings as may be required round the openings of the sky-light. Do whatever other plastering in stucco work that may be required in and about the building, and clear off all plaster rubbish and scaffolding in and about the building. Glaze all sashes about the building, after priming and sizing, with the best quality Redford crown glass--clear and free from spots or winds--bedded in putty, and back puttied and fastened. The sizes of the glass will be the same as in the adjoining building (Rotunda) according to their ranges, those of the basement and sub-basement excepted, which will be about as large as those above. All the sashes to be painted once in size and three coats in oil on the outside with the best quality of white lead. All the dressed wood work inside once in size and twice in the most approved manner, with or without oil, as may be directed by the architect; and all the outside wood and iron work three times in oil---using the best quality lead and oil. If required, paint the whole of the exterior walls of the building with four-coat-work. 1st coat, saturating the brick face with oil; 2d coat, coating the whole with yellow ochre paint; 3d and 4th, coats of pure white lead and oil, with a tint of yellow ochre, forming a light stone color. Clean all the windows, at the finishing of the building, and if required, finish the principal story doors in oak or wood colors, as may be ordered. Prepare and fix a metal roof of tin or galvanized iron, as may be hereafter directed, of the best quality, over the whole of this building; the carpenter to prepare the ground work for the same. Form the requisite gutters and down pipe, as may be directed by the architect. Finish round the sky-lights party walls and chimney stacks, and do whatever other work that is necessary to complete and secure the roof from leakage. Provide and fix to the walls, &c., the requisite pipes for the passage of the bell wires or speaking tubes while the brick work is in progress--all to be done in the most workmanlike manner, and with the best quality material of the kind. Provide and assist to fix in their places all the wrought iron work required by the carpenter or bricklayer during the progress of the building, such as clamps, bolts, hold-fasts, window and chimney bars, and such like other work. Provide and fix in their places the requisite cast iron round columns of a neat pattern for the different stories of the building, the lengths corresponding with those named under the head of "Carpenter"--the diameters to be proportional to the weight to be sustained beyond the common proportion, which information will be hereafter furnished. The best quality ironmongery to be provided of such descriptions as may be required by the carpenter, who is to judge of the suitableness of the same.